STOX Energy Blog - Muscle pain: is it a good or a bad thing? Muscle pain: is it a good or a bad thing? Muscle pain can be seen as a natural process in which your body becomes stronger. When you're training, small cracks develop in your muscles. Because of these damages, water is retained and there is a chance your muscle will swell. Fortunately, your muscles can completely recover themselves, and as a result they work together even better than before. Our muscle fibers eventually become thicker, but the amount never grows: the number of muscle fibers you have is genetically determined. With an extremely strenuous effort, you can also experience muscle pain during the exercise. Your muscles can't immediately get rid of waste products such as lactic acid. This creates an accumulation of waste products, which leads to muscle pain. When do you get muscle pain? When you do something you're not used to do, or something that asks for a lot of physical effort, muscle pain can occur. But it can also occur when you've been in the same position for too long. Even stress and flu can lead to muscle pain. If you are in the same position while working or studying, it's smart to bring some variation to your work position. 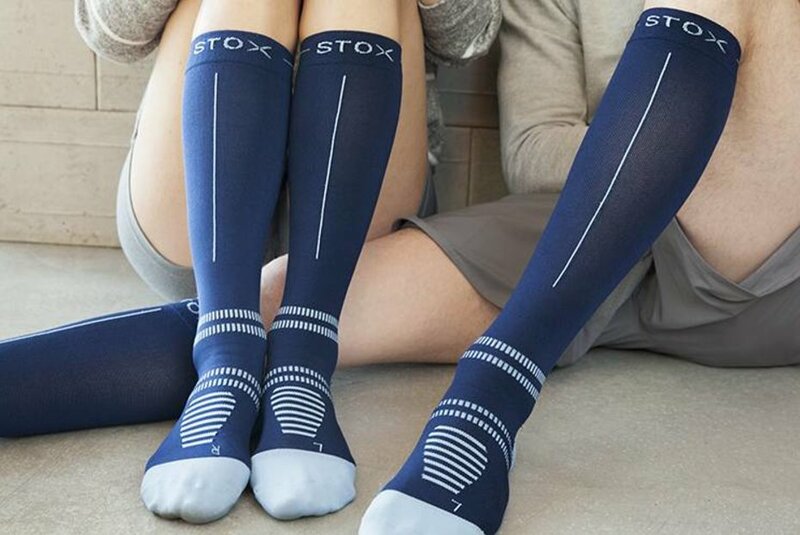 To prevent painful or tired legs after a long working day, STOX Work Socks can be the solution! These ensure that the blood circulation in your legs is optimal, and that your muscles get the maximum amount of oxygen. 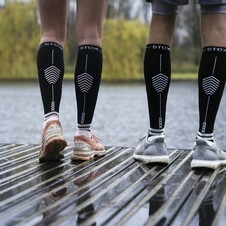 The compression technology gives pressure from your ankles upwards to your knee. This way blood and fluid are pushed back upwards. The socks are also very durable and comfortable. Your worry's about cold or sweaty feet at work are over too! 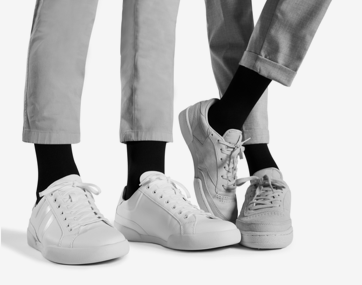 The so-called Moisture Wicking Fabrics ensure that your feet stay at a nice temperature. In the end, no one likes pain, and it is something we all want to prevent. While it is not always possible to completely prevent muscle pain, you can still do a lot to reduce it. A good warming up is really important. Your brain can prepare, your heart can gradually increase the oxygen circulation and your muscles can ease. Because you are switching from a state of rest to a state of effort, it is wise to have a warming up of at least 10 minutes. But cooling down is just as important! This way the waste products can leave your body, so in the end the muscle pain will be reduced. Sometimes muscle pain is not inevitable. Your muscles often become weaker if you have muscle pain, which doesn't work very motivating to start exercising again. You want to recover as quickly as possible. The most important thing is rest! After a heavy effort, you should allow your body time to recover well. The most effective way to get rid of your muscle pain is to 'rest actively'. Instead of waiting in bed until you feel no pain, it is better to keep moving a bit. This is how you stimulate your blood circulation and waste products can be disposed of more quickly. The STOX Recovery Socks also help you to quickly recover from muscle pain, because important functions of these socks are the removal of waste products, blood and fluid. The compression causes pressure from the ankles upwards, so that blood can quickly be returned to the top. Moisture does not get a chance to get out of the blood vessels due to pressure. 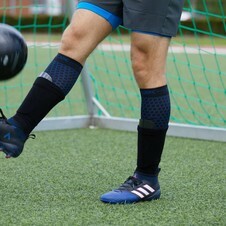 And besides a quick recovery from muscle pain, the socks also help you to quickly recover from injuries, shin splints, calf problems and Achilles tendon problems! 'No pain, no gain', is it true? Heavy efforts lead to muscle pain. If you have muscle pain, this means that your body is becoming stronger. Therefore, it is certainly not bad, as long as you take enough time to recover. But when you hardly experience any muscle pain after a workout, it doesn't mean that the training has had no effect! Probably you have built up your training courses in a good way. The advantage is that you can go for it again next time, without having any pain from your previous training session. In addition, it can also be good that you train, for example, to improve your condition or to lose weight. In that case, there are other things that you can see if your training for your own purpose has been effective. So without pain you can for sure gain a lot! > STOX Energy Blog	> Muscle pain: is it a good or a bad thing?